is fueled by a rare Wolf-Rayet star. W-Rs are incredibly hot, and expel their outer layers of gas at tremendous velocities. 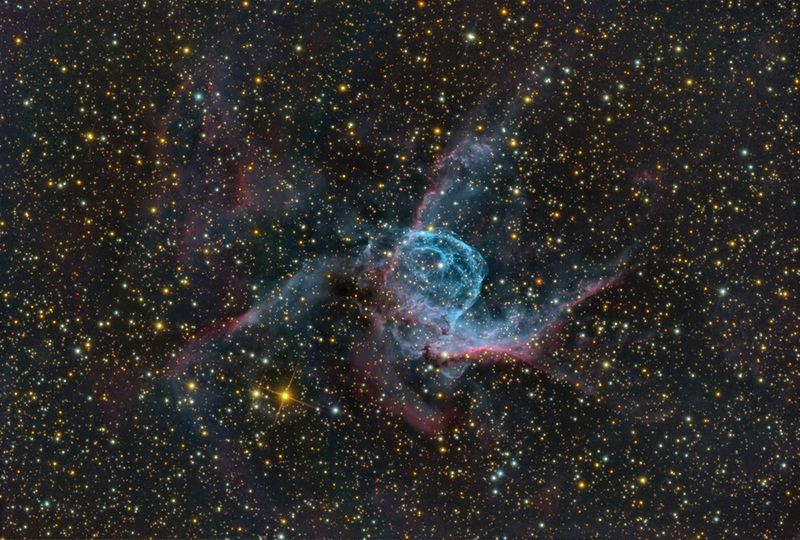 Thor's star HD 56925 has blown multiple bubbles of ionized gas, resulting in a 'helmet' of both O-III (Oxygen 3) teal and Ha (Hydrogen alpha) pink. Tilt your head right to visualize the horned Viking Helmet in this composition. Thanks again to David Plesko for acquiring this fine data and asking me to process it. Our image appeared in the February, 2010 Astronomy magazine Reader Gallery.